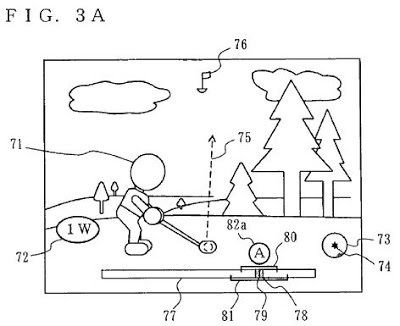 The ‘010 patent describes a golf game which features a shot mode where the player presses a button as a cursor moves along a gauge. The first time a player presses a button the shot is started, the second press of the button determines the shot power, and the third time the button is pressed the location for the shot is determined. The gauge is a long block shape. When the player starts the shot the cursor moves along the gauge from right to left. The player controls how hard the ball is hit by pressing the button again when the cursor moves down the gauge. The closer to the left end the player presses, the harder the shot power will be. Finally, the player can control the location of the ball by again pressing the button as the cursor moves back toward the right side of the gauge. There is a line on the gauge that if the cursor stops on it, will make the character hit the ball straight. Thus, the player is given full control over the shot power and location the ball is hit depending on his ability to time his button presses with the cursor as it moves along the gauge. A game machine and a game program are provided which allow a wide variety of players to enjoy a game, represented by a golf game, in which the player performs an operation of moving an object. The present invention provides a golf game machine that displays a scene in which a player character 71 hits a ball in a game field according to a shot power and a hit location. In addition, the golf game machine displays on a display device a gauge 77 and a cursor 78 which moves on the gauge. The golf game machine adopts an auto shot operation, in which a third input is omitted in the shot operation, and a manual shot operation, which requires the third input. This allows a wide variety of players to enjoy the golf game. 1. A golf game machine having a dynamic shot mode selection mechanism which displays on a display device a gauge and a cursor moving on the gauge along with a scene in which a ball hit by a player character travels in a game field according to a shot power and a hit location indicated by the cursor on the gauge, and wherein different shot operation selection inputs are performed by a player during a golf game club swing operation, the golf game machine dynamic shot mode selection mechanism comprising: at least one controller having a plurality of control switches for providing a sequence of inputs to said game machine including at least a first input, a second input and a third input, wherein movement of the cursor along the gauge is initiated by the first input from the controller, the shot power is set in relation to a first detected position of the moving cursor at a time producing the second input from the controller, and the hit location is set in relation to a position of the cursor at which movement of the cursor is stopped; start cursor movement process programmed logic circuitry configured to receive said first input from the controller and start the cursor moving along the gauge in response to said first input; input processing programmed logic circuitry configured to receive, as said second input from the controller, an input by a first control switch among the plurality of control switches or an input by a second control switch among the plurality of control switches; and cursor position processing programmed logic circuitry configured to determine, as a cursor first detected position for setting the shot power, a position of a moving cursor at a time of receiving the second input from the controller when said second input is produced from said first control switch said controller, and then determining a subsequent position of the same moving cursor at a time of receiving the third input from the controller as a hit location position on the gauge at which movement of the cursor is stopped; and said cursor position detecting programmed logic circuitry also being configured to determine, as a cursor first detected position for setting a shot power, a position of a moving cursor at a time of receiving said second input when said second input is produced from said second control switch of said controller, and then automatically determining a different position on the gauge as a hit location position at which movement of the cursor is stopped, wherein different first and second control switch activation patterns are recognized by the golf game machine to enable a player to dynamically select between a plurality of different shot operation modes during each club swing operation.